A new test for industrial catalysts developed by chemists at Utrecht University uses fluorescent molecules to show which of three catalysts works better than the others. This makes it much easier to work on improving the catalysts, while also making production processes in the chemical industry more sustainable. The researchers, under the leadership of Prof. Bert Weckhuysen, will publish their results in Nature Chemistry of 5 November. In their research, the chemists from Utrecht studied the sustainable production of methanol, one of the building blocks for products such as plastics. Sustainable methanol can be synthesised from carbon dioxide and hydrogen gas produced using wind power, solar energy or household waste. The catalyst is needed to ensure that the reaction produces as much methanol and as few by-products as possible, at the ideal temperature. The catalyst's composition and porosity are important aspects of the process, but so is its shape. "Scientists study catalysts in their powder form, but chemical plants use catalysts in their shaped form, so we wanted to find a method that we could use to study such catalyst bodies in detail," explains Bert Weckhuysen, professor of catalysis, energy and sustainability at Utrecht University. To that end, the researchers brought a piece of equipment akin to a pasta machine into the lab, to produce catalysts in a variety of shapes and sizes. Prof. Weckhuysen and colleagues studied cells by 'colouring' parts of them with fluorescent molecules. Under a fluorescence microscope, they could clearly see where the components are located and how they move through the cell. Weckhuysen and his colleagues used the same technique by inserting fluorescent molecules into the catalyst and examining the results under a fluorescence microscope. 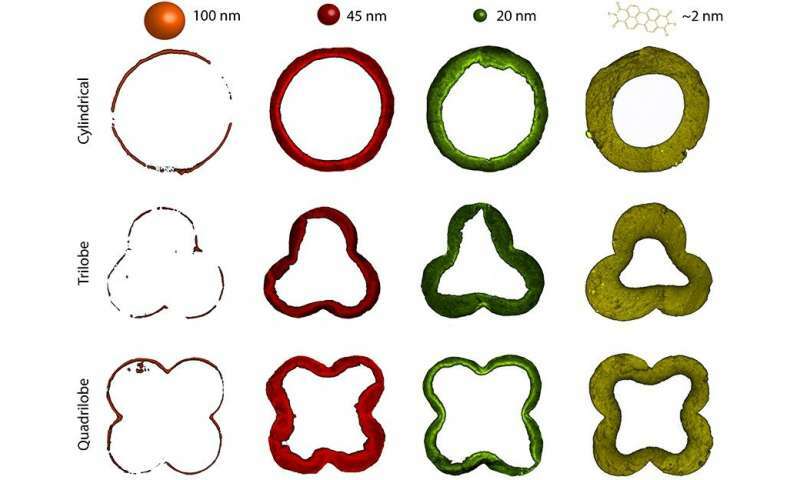 "You can see at a glance what effect different shapes, dimensions and compositions of the catalyst can have," says Dr. Gareth Whiting, lead author of the publication. Whiting produced an entire series of catalysts that differed in shape, composition, and thickness. He then tested how well they functioned in converting the raw materials into methanol using the fluorescent molecules. Under a microscope, he could see how well the molecules reached the locations in the catalyst particles where the chemical reaction takes place. The methanol yield also indicated how effective the catalyst particles were. "These results were surprisingly easy to explain and predict using fluorescent probe accessibility models," Whiting explains. "In doing so, we've proven that our research model is extremely robust. Producers and users of catalysts now have a new, fast, and easy way to see whether changes to the recipe or shape of a catalyst have positive or negative effects." Bert Weckhuysen's lab is known for the highly advanced techniques it develops to examine catalysts during a chemical reaction. "But I believe it's important to tie advanced science to day-to-day practice," says Weckhuysen. "Only then can we actually make progress when it comes to issues such as more sustainable production of materials and energy. Plus, it's just so much fun to work on things from a completely different perspective."